How Does Probability Recursion Work? I don't undstand how the textbook come up with recursive forumulas. Consider the following gambling game for two players, Black and White. Black puts $b$ black balls and White puts $w$ white balls in a box. Black and White take turns at drawing at random from the box, with replacement between draws until either Black wins by drawing a black ball or White wins by drawing a white ball. Supposed black draws first. I'm not sure how they knew their equation encompasses all ways Black could win. The first draw could only be be Black or White. $= P($Black wins$|B)P(B) + P($Black wins$|W)P(W)$, obviously this encompasses all ways Black could win. And how to set-up recursive probability equations in general + when to use them? We can use a recursive method here because if the game continues past the first two draws, then the situation is exactly the same as at the beginning of the game. 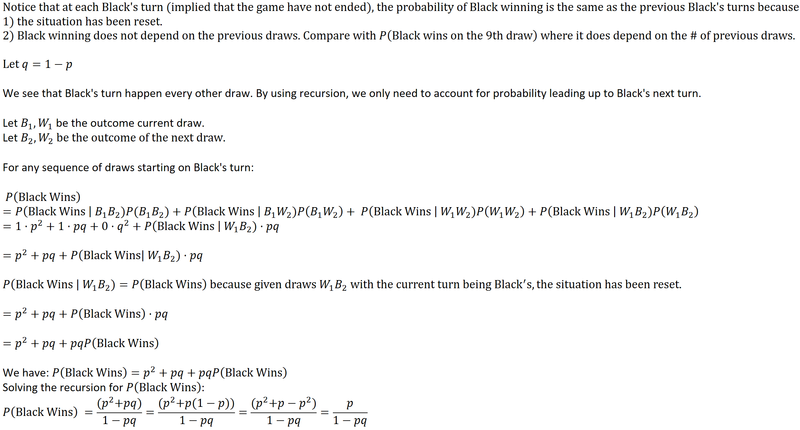 Thus the probability of black winning from that point cannot be different from the probability of black winning from the start. Montmort's card matching problem: Distribution of the number of matching cards? Is my intuition about this statistics problem sensible? Why does probability work like this?